Welcome to B&J Pitstop's Website! For ten years B&J Pit Stop has been first choice for regular vehicle maintenance such as oil changes, tune ups, brake service, tire rotation and changing of your belts, hoses and much more! 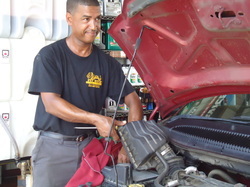 B&J Pit Stop is now a full service auto repair center. You can feel confident knowing your car is in the hands of true professionals in the automotive field.